New adventures for the 5th edition of the world’s first fantasy RPG! World-neutral, stand-alone, and ready to drop into your campaign! Goodman Games is once again launching another Kickstarter and this time it’s a collection of adventures for D&D5. I shall be backing this project as Goodman Games have always come through with the goods. I’ve been gaming since the 1st edition of AD&D, even though I had the red box edition of D&D I never really got around to playing it. 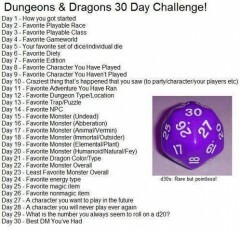 Taking into account all the editions of the game with the exception of D&D4 or D&D5, I would probably say that my favourite edition would have to be either 3.5 or Pathfinder; both these editions expanded upon a game I loved and made it better in a number of ways. Without a doubt it has to be Cthulhu. I know it’s a bit of a contentious choice but according to the first printing of Deities and Demigods he’s a god and that’s good enough for me. Play as a clutch of young drakes who must use the power of friendship to protect their homeland from an ever-growing Darkness. This is something I haven’t seen since the old Council of Wyrms setting, a game where you can play a dragon. The game has funded by quite a large margin so it could well be worth backing it. The Forgotten Realms is by far my favourite because of the amount of detail that has been lavished upon it. I remember seeing all the adverts in the comics I used to read advertising this wonderful new land to explore and play in. It was my friends who first got me interested in the realms as they were reading the novels and I thought it sounded a pretty neat place to run adventures in. I remember that I was overcome with joy when I finally got the original grey box edition and poured over the books inside, it left me feeling ecstatic and determined even more to use this world for my campaigns. After that I bought each book I could and devoured the realms lore contained within; each volume adding more layers of detail that could be peeled back and digested at will. For the hard to get stuff I tracked down the miniature reprint editions and did my best to read them. Somewhere I have the Undermountain reprint boxed set signed by Ed Greenwood himself. I really liked the Volo’s guides as they were written as a travel guide so I could hand that volume to my players and they could get a taste of what the area covered was like. I even managed to get hold of the Forgotten Realms atlas and the CD-ROM with the Campaign Cartographer maps. Now I had the ability to print out the areas that the players would visit, going down to the smaller regions for the hamlets. I was less enthused when the world was updated for 3e as the physical geography changed and so all the lovely maps I had were pretty useless if I wanted to keep using the setting as is for this edition. For the last campaign I started I went back to Greyhawk as I knew very little about the realm and thought it would be a different change of pace. Vampire Hunters is a cooperative board game for 1-4 players. Take the role of a hunter against vampires! Looks like an interesting board game but I don’t know if the rest of the gaming group would be interested in it. I’ve always had a soft spot for the magic using classes, mainly the arcane not the divine wielder. That’s not to say that I haven’t played clerics or the like but I could never really plan ahead to master the strategy of spell selection. For the main part the cleric doesn’t get the respect they deserve; if there are no undead to be had then you get treated as a walking healing machine. For a long time I played wizards, I could understand the spell strategy required and it was easier to select what spells to memorise for each day. When 3rd edition appeared I was still looking at wizards and the fact you got a familiar to start with. It wasn’t until a short time later I decided to try the new sorcerer class and I’m glad I did. I felt that what you sacrificed in additional spells was compensated by the fact you could cast whatever one you needed at the time and the bloodlines gave you more definition of the sorcerers personality. For me you can’t beat playing a human. Part of me could see the appeal of all the wonderful races but none of them really appealed to me; that’s not to say I haven’t played other races but I keep being drawn back to the human. This was before the human was buffed up in 3rd edition or later volumes; once the new game hit the shelves I still played humans as there was more of a balanced reason to do so. If push comes to shove I do like playing half-elves as I like any race that has some sort of magical aspect to it.